I figured I would post a break before I ran this week's Free Agent Draft. Hopefully, we'll see cards we've seen before and dole them out after the draft. Then again, it is always fun to bust a pack in which every player is already signed! Tonight, I've got a pack of 2009 UD Spectrum. 4 cards per pack. Man, only 4 cards... Bummer. What?? Am I the only surprised that Giambi is a free agent? Probably. Haha! Well, we split the pack. 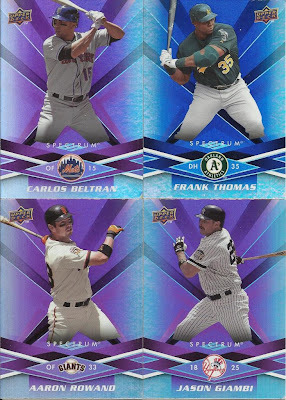 Two managers snagged cool cards, and two players will go into the draft next time since we hadn't seen them before. I really thought we had seen Rowand before, though. Not according to Access, anyway. A quick sort and I see we had Aaron Rowe and Hank Aaron. One could see how I would confuse Rowand with either of those, I'm sure. HA! I will have the results of the draft later this evening!